The Thai market is bustling with people at six o’clock this Saturday morning. My co-worker and close friend has invited me and three other interns to her home village for the day. In preparation, we fill a plastic bag with rambutan, a fruit that looks like spiky red golf balls, for thirty baht—the equivalent of one dollar— to bring to her family in gratitude. On our journey north from Chiang Mai, we appear to be riding on clouds to Chiang Rai, the northernmost province. We pass lush blue, green, and brown hills to my friend’s village. People in this particular village are from the Akha ethnic minority group. The Akha are one of Southeast Asia’s hill tribes, an indigenous people group who have been living in the mountainous regions for generations. With our friend, we will spend the day exploring her steep home. Our welcome is warm. We express our appreciation to her family for allowing us to come by presenting our fruit from the market. In exchange, they dress us in Akha traditional clothing: hand-stitched, intricate patterns of bright green, blue, red, and pink fabrics passed down for decades. In true Thai nature, we have a photo shoot complete with countless selfies. The day is relaxed, laid back. We visit her church for a thanksgiving service. We sit barefoot and rest on the elevated front porch of her childhood home, constructed of emerald green wood walls. It is in this shade that we snack on sour, yellow passionfruit, crunching on the seeds we spoon out of the slimy fruit. My friend tells stories of her childhood here as we chew chestnuts and sunflower seeds and drink orange-flavored Fanta. I can’t help but peek at the breathtaking views of the multi-colored tin roofs and mountains in the distance. The day unfolds like the the golden rain of Ratchaphruek, Thailand’s national flower, and then we are on our way home. As we ride back on the Thai highway, sitting in the bed of a black pickup truck under the Southeast Asian stars, I realize something both simple and profound. Throughout the day, I had exclusively seen my friend’s village as the place where she grew up. I did not look around only to see all of the things that the media and other voices have told me to believe. The entire day, I saw the village as someone’s home. Simply because it is. As are all places scattered across this earth. I saw the community strictly as part of God’s good creation in which He delights. I visited my friend’s home, and it was good. I think we can be bearers of justice in both the lens through which we view the world and the language we use to speak about it. When we see the world through a redemptive lens that showcases all places and peoples as part of God’s good creation, we use different words. Words of beauty. Words of restoration. I sincerely believe Satan wants me to see this world through the lens of the fall. I recognize that the world is broken because I am reminded of it by my own actions each day, and by the apathy lodged deep in every unreconciled corner of this world. But I know that justice starts with reconciling my thoughts, words, and actions back to a God who looked His creation up and down and declared it to be good. And if I have the audacity to believe that my God can use words to speak creation into existence, it would be foolish of me to believe He doesn’t care about the ones I speak. The character of Jesus shows us that in God’s kingdom, justice means flipping worldly norms on their head. And that means that justice should look like the reversal of the dominant narratives of this world that paint communities in the Global South as broken, as poor, as dangerous, as disempowered, and as lesser. A deficit orientation dishonors God. Communities like Akha villages in Northern Thailand are sacred spaces. Those hills I walked are holy ground. But our words can be a weapon whereby we further marginalization, exclusion, and lies. They can perpetuate historical injustices by stereotyping peoples and places, reducing them with words we would never use on ourselves. Or our words can be a force of light. Our words can forge the way of justice by naming both histories of oppression and colonization, and the reality of God’s restoration. The words we use can tell the truth—there are powerfully talented people from these communities doing God’s work through the local church, each and every day. Our words can name the created beauty in a place and a people—like my friend, her home, and sour passionfruit, enjoyed with glimpses of mountain ranges, just over the horizon. Jesus cares about it all, even down to the very words I use. Now far from the mountains of Thailand, pursuing my graduate studies in International Educational Development at the University of Pennsylvania, I am intentional about my words. I must be. Speaking truth is one way that I honor my friend and give glory to the God who made her, and me. 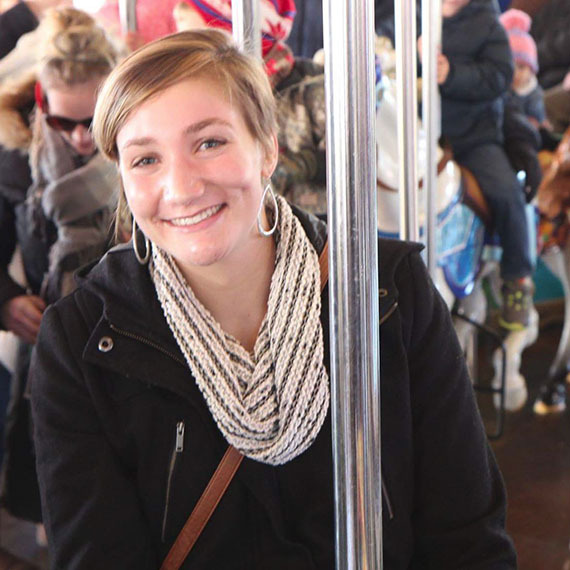 —Megan Schug earned a bachelor's degree in Applied Developmental Psychology from the University of Pittsburgh in 2014, and she will graduate with a master's degree in International Educational Development from the University of Pennsylvania in December 2016.